Every year I choose a word which will be my focus for the 12 months ahead. I give it quite a lot of thought during December examining both the positives and negatives in my life. The idea is to choose a word that will improve your life, and sometimes change isn’t easy, and change is necessary for improvement. It is no good choosing a completely positive word (although that cannot be ruled out), it is more about choosing a word that will enhance your life, a word that when you reflect this time next year, you know has made you grow. As I start my fifth ‘Word of the Year’, I am both cautious and excited about the word I choose. I know from experience that these words can be powerful. When I first came up with the concept, I had no idea if it would work at all. I had simply hit a very dark period of my life and I know that something needed to change. Although I do love new year’s resolutions and try very hard to keep them, I knew I needed more. The idea is really simple – choose a word that you feel might be the word for you and start by simply meditating on the word. My experience is that as I focus on the word it becomes part of my life. Of course you need to make some active decisions to make changes in your life – with your word as the focus. 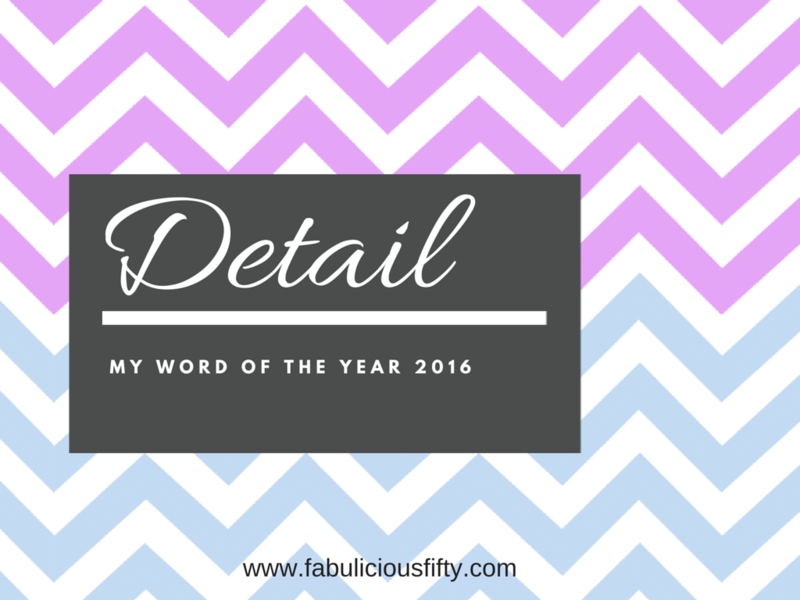 So after the words – BALANCE, CHANGE, DISCIPLINE, and CREATE, what word did I choose for 2016. I chose DETAIL. I am a big picture type of person. I think big – I see the big picture and am great at putting a good plan and strategy together (especially in my working life). However in order to make things happen you need to focus on detail. I know that I need to give more attention to detail in all areas of my life. I need to be neater, less messy, and when it comes to personal paperwork there is some attention to detail needed too. I always feel so much happier and in control when I know that the i’s have been dotted and the t’s crossed. I don’t know about you, but I think that life is just lived at such a hectic pace these days that those little details are often overlooked. This year I am committing myself to DETAIL. I am looking forward to making DETAIL a strong part of my life and ending the year with a little more organisation in my life. Thanks for reading and please pop back for some ‘detailed’ updates.